Beverly Cleary's birthday sparks a nationwide celebration of reading. Every year on April 12th, Drop Everything And Read (D.E.A.R.) Day, families are asked to put aside all distractions and read for 30 minutes. This day of reading is celebrated on Beverly Cleary's birthday because of her Newbery Honor book (1982), Ramona Quimby, Age 8 . Beverly Cleary wrote about D.E.A.R. in the book (pages 39-42) because she received many letters from her readers expressing their love for the reading activity. Ramona shares the same excitement and describes it as "the best part of the day." On the D.E.A.R. website there are tons of resources to make your day extra special at home or at school. There are resources to help you host an event. Also, there are lots of reproducibles (certificates, sticker templates) and activity ideas (parents, librarians, and teachers). 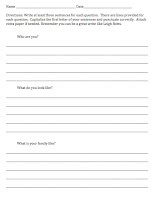 Near the beginning of the book Leigh Botts is in sixth grade and is required to do an author report to improve their writing. He puts together a list of questions that he sends to Boyd Henshaw to help make his report a little easier. Mr. Henshaw does respond, however, not in time for the report and the answers to the questions were not answered in the way that Leigh expected. 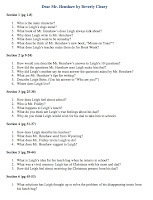 Additionally, Mr. Henshaw includes 10 questions for Leigh to complete. I assigned these 10 questions to my students as a writing assignment. The answers were very interesting, however, they were as thrilled as Leigh was to be doing all the writing. I had also created comprehension questions that I had available to ask my students during and after their reading. However, some of my students needed a little more support. 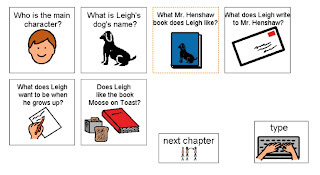 At the time I was reading Dear Mr. Henshaw with my class I was experimenting using visual supports with my students to aid in comprehension. I was using a program called Speaking Dynamically Pro with Boardmaker that was usually used for students that have communication difficulties. I liked the software for its ability to quickly make visuals that had auditory feedback. I made a PDF of the visuals for my Dear Mr. Henshaw questions. This PDF doesn't have the auditory component because you need the special assistive technology software to access that feature. I am sure you could still come up with a creative way to use these printouts as you read the story. However, if this software is available to you, just send me an email and I can get the original files for you to use. Last year right after Cleary's birthday, I found The Growing-Up Feet at a used book sale. When I found this book I was not aware that Cleary had written any picture books. However, I have since learned that she has written six picture books including Hullabaloo ABC and Janet's Thingamajigs. 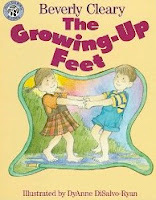 The Growing-Up Feet is a story about twins whose mother felt it was time for them to get new shoes. However, Mr. Markle, the shoe salesman, discovers after a measurement that the twins' feet hadn't grown enough to warrant new shoes. Jimmy and Janet's mother takes the suggestion of Mr. Markle to buy boots that will fit over the current shoes and stretch to fit over the next pair too. Jimmy and Janet leave the store happy but soon find that there are no puddles to try out their new boots. But, that doesn't stop them from wearing them until bedtime. The next day, Jimmy and Janet's father has a clever idea to provide the twins with a chance to try out the new books. My children loved this book. I am so happy that I saved the book (and remembered where I kept it!) to celebrate Beverly Cleary's birthday. My children have a birthday tradition with their grandmother, where she takes them to a real, old fashioned shoe store to be fitted for new shoes. It is the same store where I bought my shoes when I was little. It is a very big deal for the whole family to get shoes at this store. The experience that Jimmy and Janet have at the beginning of the book is very much the same experience that my children have each birthday. A caring salesman, tiny chairs all in a row, a knowledgeable and honest fitting, and lots of smiles leaving the store with a new pair on their feet. The best part about this book is that I now I know how to avoid meltdown by asking, "Do you have any boots on sale?" if my children's feet are not ready for new shoes. Thank you Beverly! Beverly Cleary - one of my favorite authors from when I was younger. Thanks for sharing. And, plus, I will look into D.E.A.R..